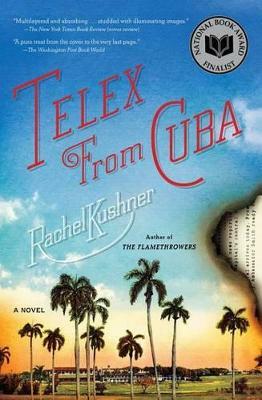 Set in the American community in Cuba during the years leading up to Castro's revolution--a place that was a paradise for a few--Kushner's first novel is a tour de force with the urgency of a telex from a forgotten time and place. Rachel Kushner has written an astonishingly wise, ambitious, and riveting novel set in the American community in Cuba during the years leading up to Castro's revolution -- a place that was a paradise for a time and for a few. The first novel to tell the story of the Americans who were driven out in 1958, this is a masterful debut.Young Everly Lederer and K. C. Stites come of age in Oriente Province, where the Americans tend their own fiefdom -- three hundred thousand acres of United Fruit Company sugarcane that surround their gated enclave. If the rural tropics are a child's dreamworld, Everly and K.C. nevertheless have keen eyes for the indulgences and betrayals of the grown-ups around them -- the mordant drinking and illicit loves, the race hierarchies and violence.In Havana, a thousand kilometers and a world away from the American colony, a cabaret dancer meets a French agitator named Christian de La Maziere, whose seductive demeanor can't mask his shameful past. Together they become enmeshed in the brewing political underground. When Fidel and Raul Castro lead a revolt from the mountains above the cane plantation, torching the sugar and kidnapping a boat full of yanqui revelers, K.C. and Everly begin to discover the brutality that keeps the colony humming. Though their parents remain blissfully untouched by the forces of history, the children hear the whispers of what is to come.At the time, urgent news was conveyed by telex. Kushner's first novel is a tour de force, haunting and compelling, with the urgency of a telex from a forgotten time and place. Rachel Kushner is a coeditor of the art and literary journal Soft Targets and a frequent contributor to Artforum. A graduate of the University of California at Berkeley and Columbia University's MFA program in writing, she has worked as an editor at both Bomb and Grand Street magazines. She currently lives in Los Angeles.